The 5th skull early Homo skull from the site of Dmanisi was announced last week. The skull was discovered nearly 10 years ago, but is finally (and very comprehensively) published in Science (Lordkipanidze et al. 2013). The ‘new’ D4500 cranium goes with the massive D2600 mandible, making this the earliest and most complete skull of Homo that I know of. It’s really a remarkable specimen, for a number of reasons beyond its age and completeness. I’ve been busy traveling, teaching and writing lately, so I haven’t yet gotten to pore over the details as much as I’d like. So I hope to sporadically post thoughts on this badass new skull as they come to me. In the mean time, several of what I’d consider the top biology/anthropology blogs*** have discussed the skull, so do check those out if you haven’t already. 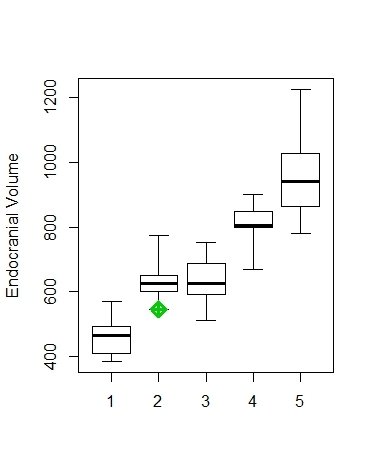 Endocranial volume for various fossil hominin fossils. 1: Australopithecus afarensis, africanus & boisei; 2: Dmanisi specimens; 3: “habilines” 4: early African Homo erectus; 5: Indonesian and Chinese Homo erectus. D4500 is green with envy. 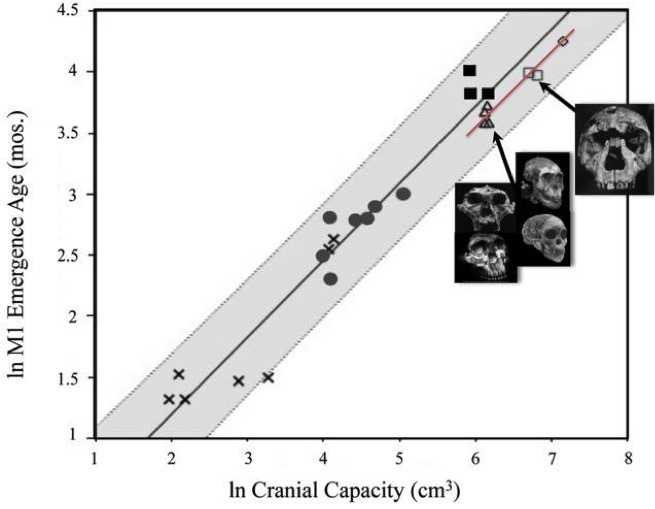 I got to see (but not study) the cranium a few years ago when I was helping with the Dmanisi Paleoanthropology field school, and I remember noting just how “robust” the specimen was – big mastoid processes, prominent and thick brow ridge, huge attachments for the neck muscles. In humans, and presumably our fossil forebears, these features are more developed in males than females, and so presumably D4500 was a male (consistent with the huge, associated D2600 mandible). In many primates, and 4 to ~1 mya hominins so far as we can tell, males are larger than females. So it is surprising that a robust probable male cranium is in fact not only the smallest in the Dmanisi sample, but also at the low end of early African Homo (i.e. habilis or rudolfensis), comparable to the largest australopiths. Of course, the only other faces known from Dmanisi are either not fully grown (D2700 and D2282) or old and decrepit (D3444), so perhaps the larger-brained specimens would have been at least as robust as D4500. An untestable hypothesis! Reference: David Lordkipanidze, Marcia S. Ponce de León, Ann Margvelashvili, Yoel Rak, G. Philip Rightmire, Abesalom Vekua, and Christoph P. E. Zollikofer. 2013. A Complete Skull from Dmanisi, Georgia, and the Evolutionary Biology of Early Homo. Science: 342 (6156), 326-331. Zhoukoudian X (Chinese H. erectus, ~1225 cc), Ngandong 10 (Javanese H. erectus, ~1231 cc); Kabwe, LH 18, Eyasi, Saldanha, BOU-VP 16/1 (African “archaic” Homo sapiens); Narmada, Jinniushan, Yinkou (Asian “archaic” Homo sapiens); Vertesszolos 2, Reilingen, Steinheim, Swanscombge, Fontachevade, Ehringsdorf, Biache, Petralona, Atapuerca 4 (European “archaic” Homo sapiens); and most Neandertals. 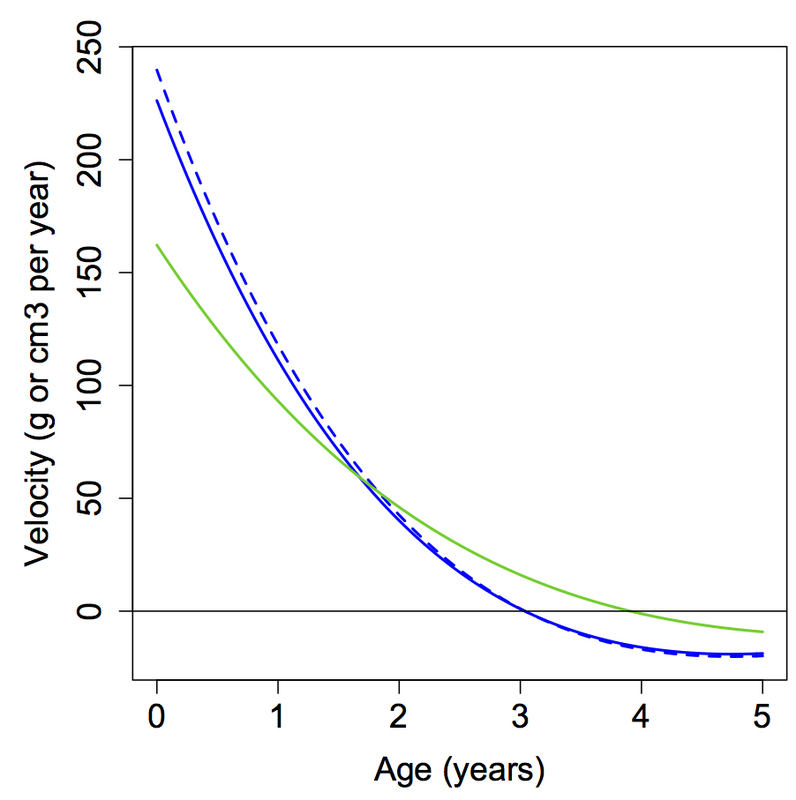 This shows that, while brain size was important in the evolution of human cognition, it is not everything. I mean, how many of these hominins could begin to fathom something like special relativity? Of course, back in the Paleolithic, when life was hard and one has to worry about how to obtain food, ward off predators and persist in some sort of society, who had time for such things? On the other hand, I’m a modern human–I have no idea how large my brain is–but I can barely wrap my mind around most things in physics. So it seems that human cognition–even genius-level, such as Einstein’s–is founded in biology, but also culture and environment. The article also tells that Falk found a “knob-like structure” in the motor cortex, and that such “knobs” have also been associated with musical abilities. I’m not a neuroscientist, and I don’t know what these ‘knobs’ are. But it sounds like scientists kind of know what these do, since they see these structures more in people who are notable for a given talent (math, music, etc) But are these inherent in the brain and allow people these special abilities, or are they more environmental in origin, arising from certain experiences and exposures? More importantly, what do these do?! Falk also found other brain abnormalities, “that she speculates might somehow be related to Einstein’s superior ability to conceptualize physics problems.” This may well be the case, but it is still unclear why this should be so. So I think this study is great, because it can provide neuroscientists with bases for future research on brain function and anatomy. At the same time, it underscores the fact that as smart as we humans are, we don’t yet understand how or why we are so special. Holloway, R.L. 2000. Brain. In: Delson et al, eds. Encyclopedia of Human Evolution and Prehistory. New York: Garland Publishing, Inc. p 141-149.